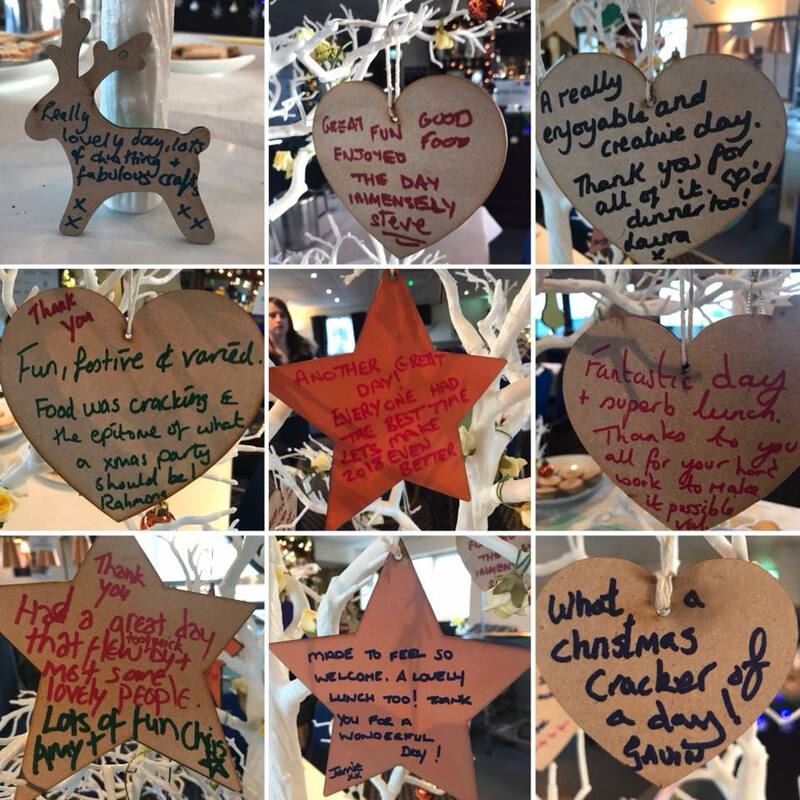 As we approach the one year anniversary of the Positive People project and the traditional end of year work wind-down, at Cosmic we've had our eyes on how to celebrate Christmas with our participants. With our partners hosting their own Christmas dinners, we thought we'd mosey on down to run and support with both digital and non-digital craft activities. Both POP Plus and Torbay Community Development Trust, community organisations in Plymouth and Torbay respectively, have supported potential clients by running engagement events bringing in those who wouldn't normally consider asking for help in tough times. These events have been critical parts of the project from day one and have been huge hits. Being in the South West, the snow wasn't quite falling all around us, but everyone on the Positive People team at Cosmic was in a cheery festive mood as we rock'n'roll Christmassed our way to George House in Plymouth on Tuesday 12th December and Torquay United's ground Plainmoor on Thursday 14th December. Vicky was left getting messy as participants were painting Christmas hanging decorations and boxes. These were all cut out of wood and were produced by Apex Laser Craft, an organisation we've worked with in the past to deliver unique experiences for clients. "The Christmas box designs our guys came up with were fantastic. As we were at Plainmoor, someone even covered their box in Torquay United stickers. Hopefully they'll come away with a good result on Boxing Day for him," said Vicky. The tech element was present too, with Jack and Silvia producing digital Christmas cards on Canva, an online design tool. Clients were able to design their own cards from scratch, bringing in different Christmas graphics and elements, and customising them to bring their own unique feel to their designs. "Canva's been such a great tool for designing Christmas cards. It's easy to learn, easy to use and has left a lot of users going away thinking how they can use Canva outside of this event. Bellissimo!" said Silvia (she's a bit Italian). Rob was manning the home made snow globes, helping to produce them from nothing but an empty jar. Digitally, we were able to print photos from their phones of their loved ones or other things that remind them of Christmas, laminate them and then put them into the finished snow globe. "I'd never done one of these before Tuesday, but I had just as much fun as our guests. Being able to print their photos really got them excited about what we could do together. Even if Em did burn a hole in our glitter bag with the glue gun twice," said Rob. Last but not least, Em could be found making wreaths from scratch out of willow, fir cones, holly and bows. This table was one of the most popular with participants - and left a lot to clean up afterwards! "It’s so nice to spend time with the participants and see the impact these events are having on them. Although I'm definitely wearing finger protectors next time," said Em, nursing her hand from a particularly sharp bit of holly! And of course, what Christmas party would be complete without the music? Resident tech wizard and DJ Ben had us sorted with a constant stream of Christmas music - although we did eventually run out and had to finish the day with Ed Sheeran. "I love Christmas music! It makes everyone feel good and contributed to a really relaxing atmosphere," said Ben. After the event, Natasha Talbot, from Torbay CDT, said "It was amazing to spend quality time with so many wonderful and super creative people. I was humbled when I turned around and saw the wreaths all laid out along the window, looking beautiful and so professionally made. Everyone made everyone feel so welcome. Wow!" All in all, the team had a great week - and two Christmas dinners to boot! We're already thinking about what we can do next year ... digital advent calendars anyone?